Meet Sarah. 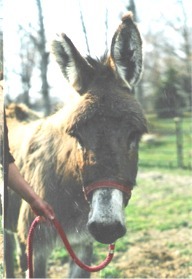 Sarah came to us a few months ago from Crossroads Donkey Rescue. When we lost Solomon this spring, Ethel (a Crossroads Donkey that was originally rescued from Ohio in 2001) was very lonely so we began looking for a new companion for her. Sarah is 25+ years old and was rescued from a farm where she was in an area with several donkeys who liked to pick on her. You can see from the pictures that her coat was in very poor condition and her feet had been neglected for years. Today Sarah’s coat is back to what it should be—no bare spots! The farrier is slowly making progress with her hoofs—although they will probably never be normal. Since Sarah arrived, she and Ethel have been constant companions.